I don’t drink but I got a free ticket to The Great Canadian Beer Festival in Victoria. The tickets are 40.00 for each of the two days. It’s gotta be hipsters, I thought. Someone goes for both days that is 80.00 plus each three ounce glass is 1.50. I gotta see this. I was right about the hipsters. Massive crowd, thousands upon thousands, every age of course, but mostly between twenty and forty. A lot of guys who look like they ride bicycles. Lean, muscular. Beards, lots of beards. Tatoos. It was a living art gallery. One guy was covered in mathematical equations. I expected pot bellies. These guys had abs. Lot of guys in groups. Maybe soccer, baseball teammates. Lot of women in pairs. Short shorts. Long hair. Trolling. Not much luck. The guys were there for the beer. I left early, maybe the action would be later. Beer lust. Good crowd. Friendly. Long lines at the booths where they got their plastic glass filled in return for tokens purchased just inside the gate. All the vendors were Canadian micro-brewers. Barkerville at Booth 25 came from Quesnel. One micro brewer was so micro itself that they don’t sell their beer anywhere but at their brewery. I was told the beer was excellent. There was a brewer from Quebec. Axe & Barrel from Victoria was offering Citruc Witbier, India pale Ale, Raspberry Sour, Sitka Spruce Tip IPA Cask. The Raspberry Sour is made with local Saanich raspberries, cultured with Ladtobacillus delbrueckii, mosaic hops that tive it a fruity aroma. My Irish grandfather loved his beer. Made his own in the basement. He wouldn’t have recognized hipster beer. Bomber in Booth 32 offered Prairie Beard Golden Ale brewed with 70% Saskatchewan barley and 30% Saskatchewan wheat in Biggar, SK. Crannog from Sorrento, BC had line ups that never stopped growing. Their lead was Backhand of God Stout. My grandfather loved stout but I don’t think his had a distinct coffee/chocolate presence. They were also offering a Crabapple Ale. There was the Dead Frog form Aldergrove, Fuggles & Warlock, Garrison from Halifax NS (Star Trek Klingon Warnog, a blend of rye, clove and tartness), Glutenberg from Montreal that promised a pure little bomb of flavours with its IPA’s citrus aroma, hop freshness and bitterness, Okanagan Spring from Vernon with a black lager. Altogether, there were sixty-four micro-brewers. There were food trucks and tents with chairs and tables. A lot of blue portable toilets. Entertainers. I felt sorry for the entertainers. There was a juggler and a guy who made balloons into silly creatures, musicians of various kinds including a good C&W band but they were completely ignored. 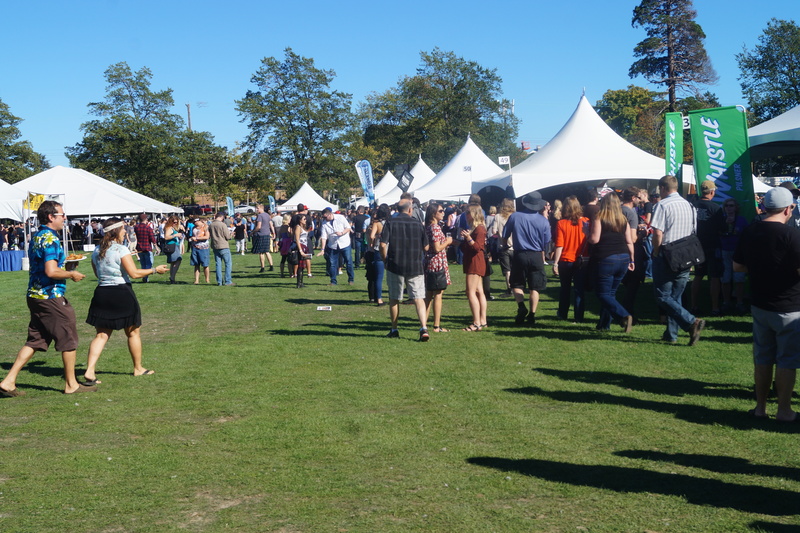 People wanted to taste beer, talk beer, admire beer. I felt so sorry for some of the entertainers that I stood and watched them just so they could say they had an audience. They were good. But not as good as the West Coast Pale Ale from Granville Island with its up front bitter hops balance with a malt base, finishing slightly fruity with notes of tangerine and pineapple. As I was leaving, I noticed hundreds of bicycles on racks along the outside fence, bikes chained to posts, bikes everywhere. I was right. The crowd was made up of people who think nothing of hopping on a bike before breakfast and dashing off to Sidney. The Gore Tex riders I envy as they race by. Beer, beards, abs, bicycles, short shorts, long hair, pink hair, green h air, oh to be young again. Even though I don’t drink, it was a fascinating afternoon, and a great success. May Howe Sound from Sqamish, BC sell lots of its Devil’s Elbow IPA. And may Three Ranges from Valemount, BC slake the thirst of many with its Swamp Donkey Brown Ale.